During the Great Depression, business conditions deteriorated and residential building had slowed to a trickle. Sales of Sears kit houses fell precipitously in 1931. In 1932, Sears rolled out a “lock and key” price for complete homes, including all materials and labor (but not the land). For 22 of their standard plans, the prices for the complete homes ranged from $3,800 to $12,000, which was beyond the comfort level of most consumers. The Modern Homes Department suffered "terrific losses" in 1932. Not only were sales of houses down, but Sears also acquired the titles on 396 properties through foreclosures or quit-claim deeds. They had foreclosure losses over $1.5M just in the first part of 1932. General William H. Rose, the General Supervisor of the Modern Homes Department, recommended that Sears continue selling homes through 1933, but if the company did not meet minimum sales volume that the business be liquidated. Sears did not meet their sales or profitability goals for 1933, and the Sears Modern Homes Department officially closed. Sears liquidated $11M in mortgages in 1934, according to the Sears, Roebuck annual report. In 1935 the Modern Homes Department reopened with very limited operations. 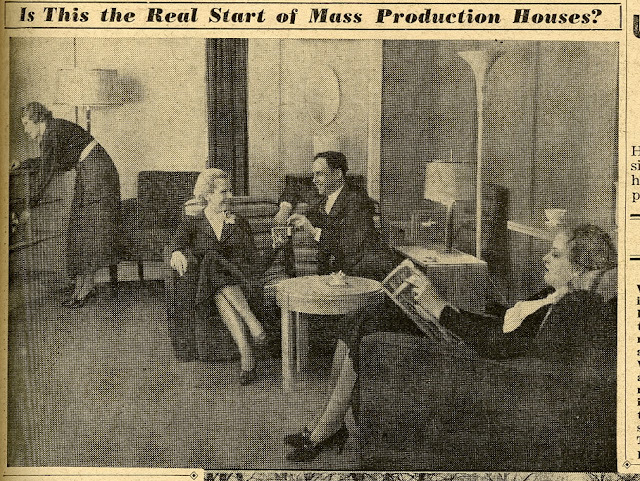 By 1935, Sears understood that their pre-cut house kits were too expensive for most Americans. Sears wanted to sell more houses to people earning between $2,000 and $2,500 per year, the lower bracket of the “white collar” class. The “Experiment” with General Houses, Inc. In August 1935, there was a meeting among four Sears vice-presidents, General Rose, and L.R. Walker (the Supervisor of the Modern Homes Department) to determine how best to resuscitate the Modern Homes business. They presented their recommendation to General Robert E. Wood, who was the President of Sears, Roebuck. The recommendation was for Sears to spend $15,000 to test the idea of selling prefabricated (not pre-cut) houses. Walker believed that General Houses, Inc., based in Chicago, had the best prefabricated house models. General Houses stated they could build a four-room house with a garage for $2500 and a five-room house with a garage for $3500, assuming they had sufficient volume. Test the public reaction to a prefabricated house and “feel the pulse of the market”. Determine whether Sears could sell enough houses to make the venture financially viable. Determine the actual cost of materials and the cost of construction. Gauge the responses of the labor unions. Importantly, Wood said he would "veto any plan for resuming the Modern Homes operations if we have to guarantee the mortgages." Sears would not be doing any financing, and planned to reach agreements with certain lenders who would offer mortgages to customers for up to $3,000. General Houses, Inc. designed and constructed prefabricated steel housing. Architect Howard T. Fisher formed the company in 1932. The company used pressed-steel panels for walls, roofs, and floors, set on a concrete foundation. After the foundation was set, a team could put a house together in about two weeks. General Houses received nationwide publicity in 1933. They displayed a pressed steel cottage at the 1933 Chicago World's Fair that attracted thousands of visitors. The house by General Houses at the 1933 Chicago World's Fair. The house was later moved to Riverside after the Fair. By August 1935, General Houses had sold only seven of the all steel houses in the Chicago area. They were very modern and very expensive, and their customers were typically Chicago notables such as the CEO of the Wurlitzer Grand Piano Company and Adlai E. Stevenson (grandson of the former Vice-President of the United States). The chairman of the board of General Houses, Edmund Lindop from Oak Park, brokered the partnership with Sears. Although the recommendation from the August 1935 executive meeting was to build one General Houses model as a test, Sears ended up paying for four houses to be built. 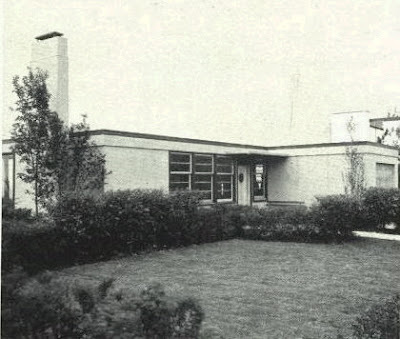 The model homes opened in May 1936. Two houses were in Lombard on Roosevelt Road and Meyers Road (where a CVS Pharmacy stands today), one in Highland Park at 3079 Greenwood (which was torn down for a McMansion) , and one in Tinley Park at 17659 S. Oak Park Avenue (which still stands today). 3079 Greenwood, Highland Park. This was the larger model which was offered for sale at $5964. The same larger model was also constructed in Lombard. Photo courtesy of the Herbert Hoover Presidential Library. 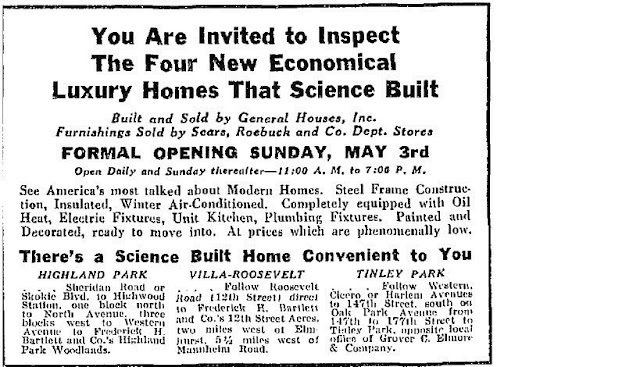 Likely based on feedback from Sears, General Houses changed their construction approach for the four models. They used a steel framing system with exterior siding panels of asbestos, cement board and insulation. They used fir plywood for interior walls. Floors were concrete but could be covered with wood or linoleum for extra charge. The flat roof was surfaced in steel. This approach was much less expensive than the all steel fabrication. 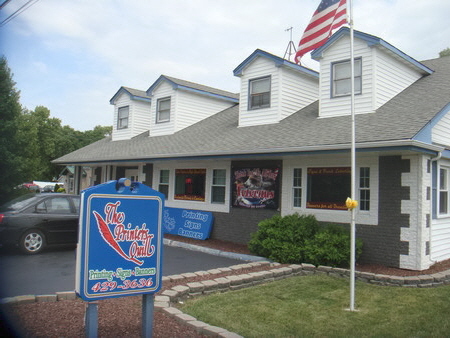 17659 S. Oak Park Avenue, Tinley Park. This was the smaller model which was offered for sale at $4910. The same smaller model was also constructed in Lombard. Photo courtesy of Amin Ahmad. The Tinley Park house is now occupied by the Printer's Quill print shop. It initially served as a residence, and then was later converted to a physician’s office. The house has been drastically changed, with a brick masonry façade and a second floor added to the building. The brick exterior threw me—I was certain the original house was torn down. However, Sears house researcher Mark Hardin was confident that the Printer’s Quill shop is, in fact, the house built in 1936. And he was correct! Sometime after the Sears executive team meeting in August 1935, Sears changed its strategy. The new plan was for General Houses to supply all the building materials, arrange for the construction through their dealer network, and sell the houses. Sears hoped to sell the new homeowners furnishings and other house fixtures. Sears executives thought that even if they were not going to continue selling houses to their customers, they would still profit if more Americans could own homes because low-cost prefabricated housing was readily available. Through the joint advertising, both firms hoped to push sales. Joint advertising for Sears and General Houses. The interior of one of the houses. All modern furnishings and interior decoration were provided by Sears. Photo courtesy of the Herbert Hoover Presidential Library. Thousands of people would tour the model houses, but there were few buyers. In the month after the models were built, General Houses reported that they had received $109,000 in orders (about 18 houses). Sears did manage to sell all four of the model houses. Sears declined to continue the partnership with General Houses after the prefabrication “experiment”. According to a Business Week article from 1939: "Sears 1936 tie-up with General Houses, Inc. ended unhappily, with dissatisfaction over too close a relation between exterior and interior temperatures in the prefabricated structures." Sears continued to sell pre-cut houses until 1942. In the later years, they began to use steel columns as part of the foundation. In 1946, Sears took another plunge into prefabricated housing. They sold a "ready-to erect" house-- partially pre-cut, partially prefabricated--under the name Homart Homes. Around 1942, General Houses gave up on steel and switched to wood frame construction. The steel houses were not economical to produce. Additionally, the houses were often not able to meet local building codes, and banks were reluctant to finance flat-roofed houses. General Houses built less than 150 houses nationwide. Today, most of the cutting-edge steel and steel-framed houses that General Houses built have been demolished. My family and I just moved into a 1945 prefabricated home in Pa. I'm dying to find out the maker of it! From what I've found so far it could be anybody, National Homes, General, Gunnison.... Unfortunately, any wall plaque that might have been here is gone. There was an addition done in the 80's, and the outside kitchen wall was removed. The concrete steps are still in the crawl space though! It has J & L steel junior I-beams in the basement, plywood paneled walls, steel roof truss, and used to have a forced air system. Any ideas or tips on how to find out!? The J&L Junior Beams were frequently used in lightweight structures and prefabricated housing. I don't think that's going to help you ID the house. It seems like you've already searched the house itself for clues. General Houses, for instance, stamped all the wall panels with their logo. Next step would be the grantor records. If the original owners financed through the manufacturer, that name might be on the mortgage records. You could also look at mortgage records, etc... check with the county. Once you get the original owner's name, you can search your local newspapers for that name and also the street address. In my town, prefabricated houses were very controversial and potential homeowners had to appear before the village board. Also prefabricated houses were often big local news. You sometimes find an article about the "Gunnison house" going up at a certain address. Sometimes the local papers also listed building permits that were applied for. It just depends on where you live. I believe I have a Gunnison Coronado home and I would like to know where the metal plate would be located as well as where I could locate: "The Gunnison Homeowners Guide"? Hi, I wish I knew more about Gunnison. They sold a lot of prefabricated homes and were in business until 1974. The metal plate would be located near the back door with the company name and logo.